The best way to learn English is to have fun, to play, by writing, producing and performing a stage or audio play. 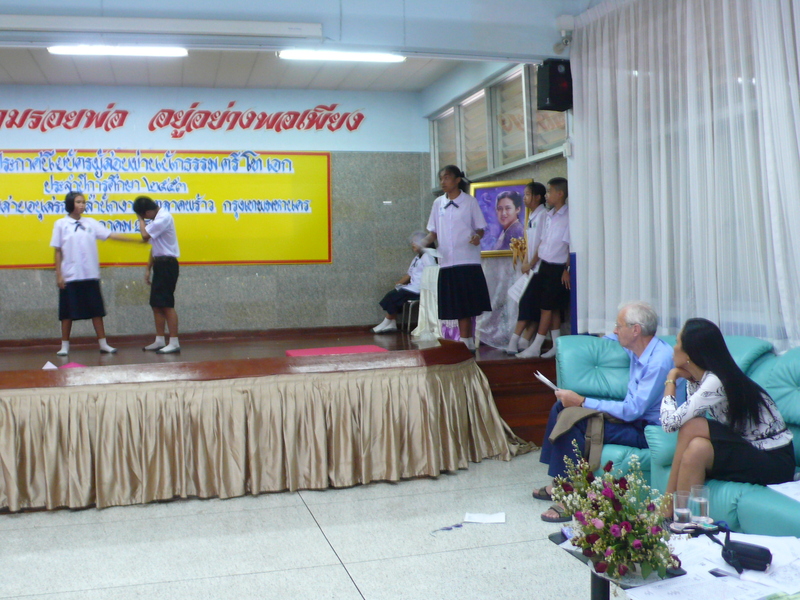 At Loysai Anusorn School, Ram Inthra, Bangkok, Thailand, we produced a play called The Wise Little Girl. To start with we were not at all sure that the children were up to it. But they had such enthusiasm and perseverance that we were amazed and delighted by their progress; by their team-work and confidence. Teachers, Miss Chulapan and Miss Mimie Acuna, were very quick at picking up the art and craft of directing. 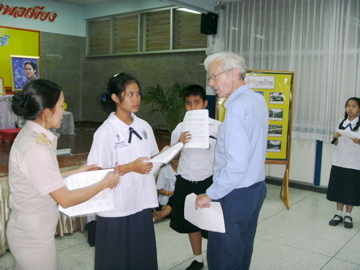 They were both loving and authoritative with the students. Play and having fun is the best way of teaching languages. 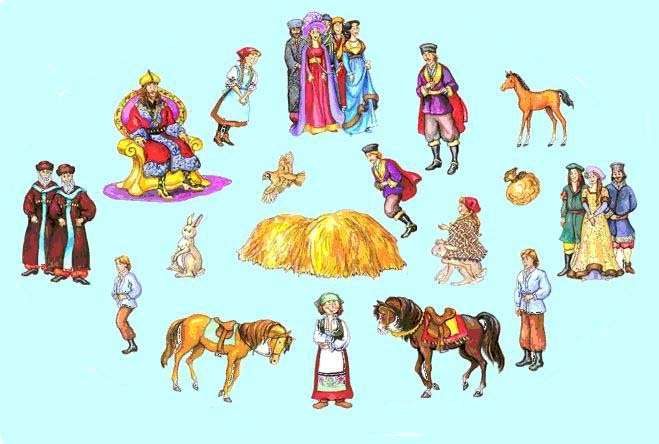 NARRATOR 1: Once upon a time in Russia, there was a little village where nearly all the inhabitants bred horses. It was the month of October, when a big livestock market was held yearly in the main town. EDWARD: I am Edward. I am rich and I ride a stallion. IVAN:	 I am Ivan. I am poor and I ride a young mare. NARRATOR 1:	 before going to sleep on two heaps of straw. (THE BROTHERS SOON BEGIN TO SNORE. MEANWHILE IN THE DARK A SMALL ACTOR PLAYING THE FOAL LIES DOWN BESIDE THE YOUNG MARE. THE LIGHTS COME UP. THE FOAL STRUGGLES TO ITS FEET, DRINKS ITS MOTHER'S MILK, THEN TAKES ITS FIRST FALTERING STEPS ACROSS THE STAGE TO WHERE THE STALLION IS TETHERED. NARRATOR 1: Great was their surprise when the next morning they saw three horses outside. Well to be exact the newcomer was not really a horse. It was a foal, to which the mare had given birth during the night. Soon it had the strength to struggle to its feet and after a drink of it mother's milk. Then the foal struggled its first few steps. The stallion greeted it, and when the two brothers set eyes on it for the first time the foal was standing beside the stallion. EDWARD:	 It belongs to me. It's my stallion's foal. IVAN:	 (LAUGHS) Whoever heard of a stallion giving birth to a foal? It was born to my mare! EDWARD:	 No, that's not true! It was standing close to the stallion, so it's the stallion's foal. And therefore it's mine. NARRATOR 1: The brothers continued quarrelling. Then they decided to go to town and bring the matter before the judge. Shaun and teacher Miss Mimie watching the little girl rehearsing solving the riddles for her father, Ivan. NARRATOR 1: On the way they met an old lady and told her what was going on. OLD LADY: If it is a foal, it must be the stallion's. IVAN: That's not a good reason. I don't believe you. A stallion had a foal!!? Come on! NARRATOR 1: Still arguing, the two brothers headed for the big square where the courtroom stood. But they didn't know it was a special day, the day when, once a year, the Emperor himself administered the law. NARRATOR 1: The brothers went to the courtroom and told him all about the dispute. NARRATOR 2: The Emperor listened to both sides of the story. One, what is the fastest thing in the world? Two, what is the fattest? And four, what is the most precious? I command you to return to the palace in a week's time with your answers. NARRATOR 2: Edward started to puzzle over the answers as soon as he left the courtroom. When he reached home, he realized he had no-one to help him. EDWARD: Well. I'll just have to seek help. If I can't solve these problems, I'll lose the foal. NARRATOR 2: Then he remembered a woman, one of his neighbours, to whom he had once lent a gold coin. NARRATOR 2: He told her about the Emperor's riddles. WOMAN: The fastest thing in the world is my husband's bay horse. Nothing can beat it! The fattest is our pig! Such a huge beast has never been seen! The softest is the quilt I made for the bed, using my own goose's feathers. It's the envy of all my friends. The most precious thing in the world is my three-month old nephew. There isn't a more handsome child. I wouldn't exchange him for all the gold on earth, and that makes him the most precious thing on earth! NARRATOR 2: Edward was rather doubtful about the woman's answers being correct. On the other hand, he had to take some kind of solution back to the Emperor. And he guessed, quite rightly, that if he didn't, he would be punished. NARRATOR 2: In the meantime, Ivan, who was a widower, had gone back to his hut, where he lived with his small daughter. Only seven years old, the little girl was often left alone. But she was thoughtful and very clever for her age. Ivan asked her advice. LITTLE GIRL: Tell the Emperor that the fastest thing in the world is the cold north wind in winter. The fattest is the soil in our fields, whose crops give life to men and animals alike. The softest is a child's caress and the most precious is honesty. EDWARD: (STUTTERING) The fastest thing is.. The fastest thing in the world is my friend's horse. Nothing can beat it! The fattest is a friend's pig! Such a huge beast I never seen! The softest is the quilt my friend made for the bed, using her goose's feathers. The most precious thing in the world is her three-month old nephew. There isn't a more handsome child. NARRATOR 3: The Emperor roared with laughter at Edward's foolish answers. However when Ivan spoke a frown spread over his face. IVAN The fastest thing in the world is the cold north wind in winter. NARRATOR 3: The poor brother's wise replies made him squirm, especially the last one, about honesty, the most precious thing of all. The Emperor knew perfectly well that he had been dishonest in his dealings with the poor brother, for he had denied him justice, but he could not bear to admit it in front of his counsellors. EMPEROR: Who gave you these answers? EMPEROR: You shall be rewarded for having such a wise and clever daughter. You shall be awarded the foal and a hundred gold coins. But.. but ..
NARRATOR 3: He winked at his counsellors. EMPEROR: You will come before me in seven days time, bringing your daughter. And since she's so clever, she must appear before me neither naked nor dressed, neither on foot nor on horseback, neither bearing gifts nor empty handed. And if she does this, you will have your reward. If not, you'll have your head chopped off for your impudence! NARRATOR 4: The onlookers laughed, knowing Ivan would never be able to fulfil the Emperor's conditions. LITTLE GIRL: Tomorrow go and catch a hare and a partridge. Both must be alive. You'll have the foal and the hundred gold coins! Leave it to me! NARRATOR 4: Ivan did as his daughter said. He had no idea what the two creatures were for, but he trusted his daughter's wisdom. NARRATOR 4: On the day of the audience with the Emperor, the palace was thronged with bystanders, waiting for Ivan and his small daughter to arrive. At last, the little girl appeared, draped in a fishing net, riding the hare and holding the partridge in her hand. She was neither naked nor dressed, on foot or on horseback. The Emperor scowled. EMPEROR: I said neither bearing gifts nor empty-handed. NARRATOR 4: At these words the little girl held out the partridge. NARRATOR 4: The Emperor stretched out his hand to grasp it, but the bird flew into the air. The third condition had been fulfilled. In spite of himself the Emperor could not help admiring the little girl, who had so cleverly passed such a test. EMPEROR: (IN A GENTLER VOICE) Is your father terribly poor, and does he desperately need the foal? LITTLE GIRL: Oh, yes! We live on the hares he catches in the rivers and the fishes he picks from the trees. EMPEROR: (TRIUMPHANTLY) Aha! So you're not as clever as you seem to be! Whoever heard of hares in the river and fishes in the trees! LITTLE GIRL: (REPLYING IMMEDIATELY) And whoever heard of a stallion having a foal? NARRATOR 4: Both the Emperor and the court burst into laughter. Ivan was immediately given the foal and a hundred gold coins. EMPEROR: You are so clever, little girl. Only in my kingdom could such a wise little girl be born! END OF PLAY. THE ACTORS BOW TO THE AUDIENCE.